This is the time of the year when a lot of people set up their new year resolutions. But the question is why wait for a new year before you set resolutions or goals for yourself? As you will see below, our goals are ongoing, and always evolving. It’s also advised to make your goals SMART (Specific, Measurable, Achievable, Realistic and Timely). But we also recommend adding some stretch goals, that will challenge you. We recommend shooting for the moon. So what are our goals? As you know one of our goals is to double our income from $400,000+/year to $800,000+/year within the next 5 years. But towards the end of the year, we realized we also needed a better work/life balance so we can enjoy more family time with our 1-year old kiddo. Get rid of the least profitable yet more demanding clients: So far we have ended 2 contracts and replaced them with 1 that’s going to be more profitable, with less work and less pressure! Concentrate on what we already have: Last year, when we started blogging, we started learning how to promote a blog on Facebook, Twitter, Instagram, Bloglovin, LinkedIn, Reddit,…And we soon realized how we had neglected promoting a product of ours that we already had. Sometimes, we feel like we are David fighting against Goliath, because we are very small fish going against an industry giant. But we won’t give up. Our mortgage started at $545K five years ago. At first, we only paid the minimum required, we did not bother paying anything extra. In all fairness, we had a lot going on, we did $40,000 in upgrades, got married, paid off $35K car loan, and did some international traveling. But 3 years later, our balance was still around $540K, most our payments had gone to interest, and very little went to the principal. Thus, we decided to sacrifice some of the luxuries and try to pay off our mortgage a little bit faster within the next 5 years no later than 2020. Currently we are on track as the balance is at $220K. By end of this year, we hope to decrease it by $80K to $140K. Every quarter we make extra payments. And what’s most exciting is that, with an extra $11,300 payment scheduled in March, we will hit $199K! Once we hit the $199K, we will definitively need to go out for a celebration. For this year, the maximum we can contribute penalty free in RRSP (Canadian equivalent to 401K) is 18% up to $26,230/person, and we plan to take full advantage of that as usual. We will also contribute $2,500 in RESP/529 for the kiddo. For every dollar you contribute, the (Canadian) government matches 20% up to $500/year. Thus, for the kiddo to get the full $500/year, we need to contribute at least $2,500/year. We also plan to do something some people may think it’s crazy, but we will discuss that in another post 😊. Our resolutions wouldn’t be complete without including the blog resolutions right? We like having weekly, and monthly blog goals, because it pushes up to hustle and also kind of allows us to relax and enjoy a weekend or two once we have achieved our weekly or monthly goals. So why not also have annual goals? Well we will keep them simple. Pageviews: Our goal is to double our pageviews from 12,800 to 25,000. We are new to blogging so not sure if this is very achievable goal or a stretch goal. Alexa global rank: Our goal is to double our Alexa global rank from 661,000 to 300,000. This will also put us into the top 1% of blogs, which goes well with the theme 😊. However, as new bloggers, we really have no clue what it takes to reach the 300,000 Alexa global ranking. We will have to figure it out as we go along. Wish us good luck, we need it 😊. Baby99to1percent needs a sibling/bestie/bff…it’s about time we give her one. We hope this happens this year. However, we wouldn’t mind if it happened next year, as that would help us have only 1 kid in daycare at a time. Around here, daycare costs are at least $20,000/year. Due to getting pregnant and having a baby, our travel has been limited to Canada and US in the past couple of years. This year, we hope to pick up international travel again and travel to Europe. Our last European trip costs us about $8K. This time we hope we can manage under $2K and with a baby. A little travel hacking will be needed. We will keep you posted. What about you guys? 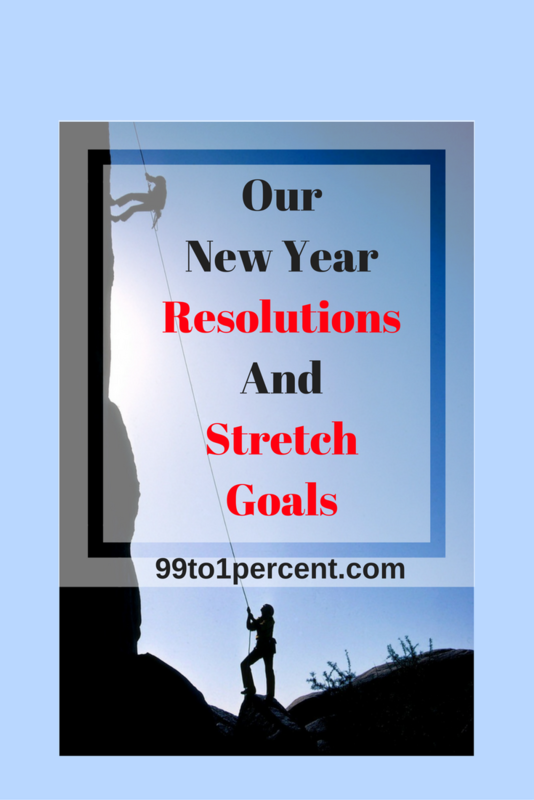 Do you have any new year resolutions or goals? Do you have any stretch goals? Care to share? Hi Tina – great list of goals, and they’re well balanced. I especially liked: “Get rid of the least profitable yet more demanding clients.” This can be such a game changer. Not only will you make more money, you’ll also save time and stress. Also, you’re never too late to post about goals – whether 2 weeks or 2 months into the year 🙂 . I love adding the S for stretch into the SMART acronym. We all need a little stretch in our lives. Good luck with your goals! Especially baby #2. I’m sure you are going to nail them. My stretch goal is to start pursuing my CPF and figure out a way to shift my career to helping people with their finances instead of corporations. That’s a good stretch goal. What’s gonna happen with your current career? It’s CFP not CPF. No idea what a CPF is LOL. If I’m 100% successful, it will be a career change. The other option is to start it as a side hustle without taking the big risk of quitting a successful career. Those are some pretty lofty goals but I’m sure you can hit them since you seem very committed to them! That’s one good thing about lofty goals, if you set them, you really want to work hard to reach them! So true, they take more efforts, but yields the most rewards. Hey 99to1%! Great goals for the new year! Looking forward to reading about you achieving them! Agree to maxing out all contributions to your accounts – we were glad we did and also paid off the car loan…next is house for us too! Congrats on aggressively getting yours down! We also have goals for kiddo #2. What I’ve learned about this topic – there’s never a good time to plan it, just go for it! You never know when you may fall into the category of 1-3% of women who have recurring miscarriages or issues getting pregnant after easily having their first kid. I always knew I was special…just never in this way 😉 I will be cheering you and any other parents that have this goal the most — celebrate life daily! I like the specifics you put in the goals – such as “decrease [the mortgage] by $80K to $140K” and “double [your] Alexa global rank from 661,000 to 300,000”. I tend to focus more on just the how and not the actual position, so it can be hard at times to see if I succeeded or not. That’s the accountant in me 🙂 But yes, it’s good to make goals measurable. The getting rid of the most demanding but least profitable clients definitely sounds like a”4 hour workweek” mentality! Sometimes the extra money is not worth it. I have no doubt you guys will reach the 25k views much earlier than the end of the year. You guys have been doing amazingly so far! I really like that you continue to set lofty goals for your blog! It is definitely one of the most exciting feelings when you see one of your blog posts got a ton of hits! We have a stretch goal as well of increasing our income. Currently we are right around 100k/year combined, and we would like to get that to $140k by the end of the year. We plan to tackle this by seeking additional career opportunities in Coding, thanks to our 6 month Coding Boot Camp we have been in. I hope you hit ALL of these stretch goals in 2018! 40% increase in income? That’s some stretch goal, but I’m sure guys are gonna kill it! Rooting for you. “Get rid of the least profitable yet more demanding client”; 20% of your clients take 80% of your time, the 80/20 rule. Smart of you to get rid of them. Excellent goals! I am sure you’ll be able to reach those pageviews with your current progress 🙂 If you need any tips for Europe (or happen to come by Copenhagen in Denmark), let me know! Thanks. We have decided on France, but we might add a 2nd country. We will reach out if Copenhagen makes the list. Thanks for offering. Awesome goals! I like how you balance between money/social/other aspects of your life. Sounds like you are on your way to great success. The mortgage goal is particularly appealing to me. I calculated our 2017 savings rate this evening and I was happy to see 52%. We got married and bought a house this year so I didn’t think we did as well as we did. We have set a goal of 70% savings rate for 2018. I think we can do it without the wedding and investment in initial home repairs and fees. Best of luck on your 2018 goals! 70%? Niiice. You guys are killing it. 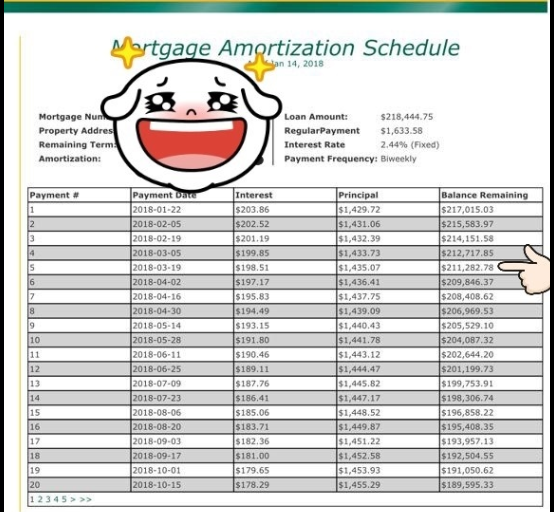 Wow, your mortgage payment strategy is really aggressive and remarkable. Our balance started where you started and we’ve been able to shave just 100k off thus far but would love to be at least under 300k. I will definitely start with sending a payment every two weeks and then go from there. Great strategy. Love your blog. Welcome back!